Pallet Stacker - Products - SINOLIFT MATERIAL HANDLING EQUIPMENT CORP.
Electric Stacker is a kind of industrial handling truck driven by electric motor. This wheel type handling truck is applicable to the loading, unloading, stacking and short distance transport of palletized goods. 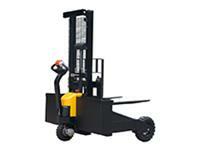 Our Electric stacker is rationally designed and is convenience to operate. It is an indispensable device in pallet and container transport, and is widely used in workshops, warehouses, logistics centers, distribution centers, ports, station, airports, cabins, and large containers. Etc.